This is not a primitive method, but is nevertheless an intriguing method of producing light and heat. When carbide is mixed with water it produces acetylene, which is highly flammable and easily ignited. So, if you have access to some carbide and can place it in a suitable container, and can safely ignite it (if, if, if...) then you could have a good supply of light and heat. 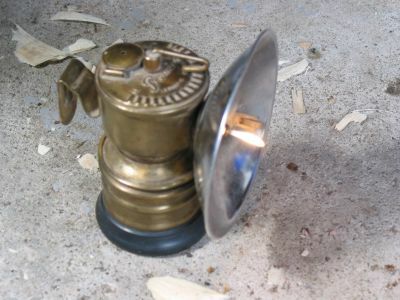 This is an old-style carbide lantern. This type of lamp is still used by cavers (people who explore caves). The flame is visible in the middle of the reflector.